A new and improved Morrisons, going back to its Market street roots. 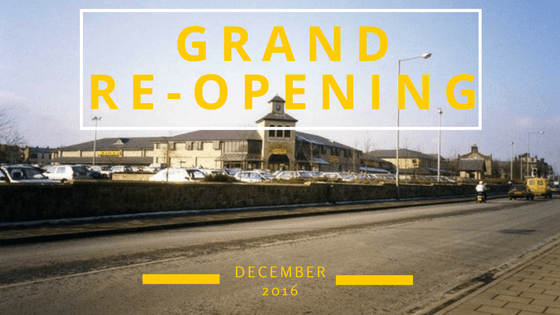 A sight that every resident of Guiseley knows, Morrisons has been a community focal point since 1989 and over the past few months there has been several changes made. Although it has been a somewhat noisy and at times inconvenient refurbishment of the store, many residents have been looking forward to see the new look and the new additions that it will have to offer. As a member of the Guiseley Gazette team, we were given a tour of the new store. You are welcomed by a new coffee shop area for weary shoppers and a sparkling new food to go area including a create your own sandwich area and take away hot drinks. The hot food, fish monger, delicatessen, and cheese monger as well as pizza counter have all been updated with new looks and located together for easier shopping. The biggest new addition to this collection of counters is the Gluten Free counter serving pizza, sandwiches and wraps made following specific guidelines and audited by the Coeliac association. Alongside this counter are several shelves and fridges to store all other free from range food items, making shopping that little easier for those with allergies and eating requirements. The fruit and vegetable area has been re-arranged with new display tables, these have been designed to link back with the Market Street roots, looking like displays found in traditional market displays. Alongside this is the new bakery offering all the freshly baked delights of before but from a new and improved location – I am actually in love with the red brick. Many of the aisles have been widened with more space for shoppers to navigate, and all the fridge items placed in glass door fridges rather than open fridges, creating a more economical way to display food. One of the must awaited new additions, Morrisons have now extended and updated their original café. With a lovely country kitchen feel seating area and a larger kitchen offering delicious menu options, it is one place all residents must visit at least once to have a nosey. Currently Morrisons have a lovely Christmas Dinner set menu on offer alongside their traditional menu. It has been an interesting and impatient wait, waiting to see what Morrisons had planned and I must say they have not let us down with all the changes in place, taking in to consideration many comments made over the years. To celebrate Morrisons are holding a collection of events throughout the day on Thursday 8th December, starting at 9:30am with a local school choir, a ribbon opening ceremony at around 11am and many more. If you choose to take a visit down to the store then please do share your pictures and opinions with Guiseley Gazette, so others can know what it is like.